Buy your tickets online as the remaining performances are sure to sell out! In song and dance with a full cast, Calder the Musical traces Alexander Calder’s life back in time from the exhibition at the Whitney Museum of American Art in 1978. Calder with the help of his Muse, Thalia discovers his path. 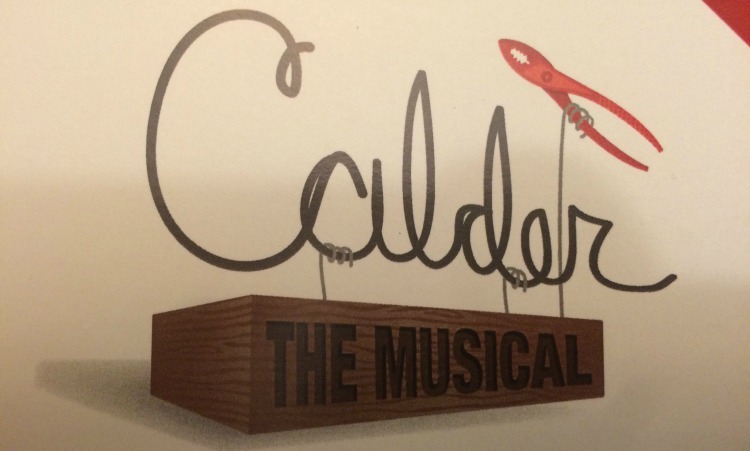 Since I first saw Calder’s gigantic Mobiles at the Guggenheim Museum in New York, I have been fascinated with Calder and this play did not disappoint. I could tell by the almost full house and the reaction of the audience that others were as intrigued by the play as I was. A young Sandy Calder sits on stage humming with a pair of pliers and a ball of wire. Even as a young child he was fascinated by creating works of art with motion and movement. We discover Calder was bullied by the other kids, loved by his mother, an artist, and almost ignored by his father, a sculptor had little time for his children. Calder retreats into his art as a peaceful sanctuary. The musical traces the ups and downs, of his career and personal life. The song and dance ranges from a sweet duet with the young Calder and his sister on motion and movement, peace and harmony; to a saucy (though still quite family friendly) Samba number with Calder and his muse, Thalia. Bravo to the Playwrights and producers, Tom Alvarez is a writer and reporter on performing arts in Indianapolis. Dustin Klein, an elementary music teacher at the Orchard School in Indianapolis. One of the best of Fringe 2016. I recommend buying presale tickets online as the remaining performances are sure to sell out. Tuesday – Aug. 23 7:30 p.m.
Wednesday – Aug. 24 6 p.m.
Saturday – Aug. 27 3 p.m.